There are many kinds of form errors you may be purposely encountered in JotForm. This form error entails different meanings. Below is a list of form errors and their meanings. 1. 404 Not Found - Websites can typically be configured to display a customized error page, including a more natural description, meaning or site's branding. 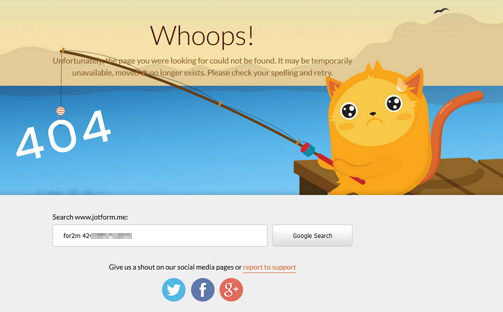 The image above is a customized 404 error by JotForm. This shows when users attempt to follow or enter a broken link. Please review the link and verify its existence. 2. Invalid Form URL - This means the form is viewed in an incorrect JotForm Domain. We have implemented a domain separation rule. Depending on what country you are in, there will be an assigned separate domain name to you. (i.e. jotform.us, jotform.me). Any forms created will only work on that domain. If you'll attempt to view your forms using different domains, the error above will show up. Clicking the link below it should redirect you to the correct form URL. 3. Form not found (Disabled by the owner) - This shows when the form is disabled or deleted. If you are a form submitter, you have to contact the form owner and ask to enable the form. However, if you are the form owner please check this guide to learn how to enable back the form. 5. Only one entry is allowed - This is called Unique Submissions. When a strict check or loose check is enabled on the form, form users can only submit one entry. Meaning multiple submissions is disabled on the form. To learn more about Unique Submissions, please check this article. 6. Form over quota - As explained in the error message, the form has passed it's allocated quota and cannot be used at the moment. This error appears when you reached your submissions limit allocated for the month. The form will not be able to accept submissions any longer when you passed the submissions limit. It's either you wait until your submissions counter resets to zero which happens every first day of the following month or upgrade to any of the available paid plans to increase your submissions limits and enable all your forms right away. 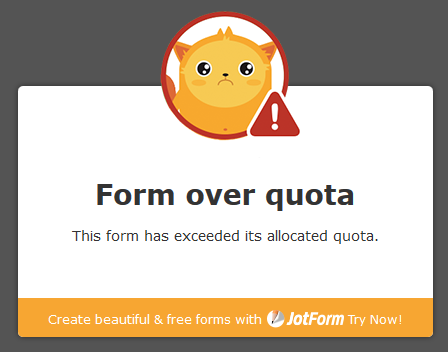 Every Jotform plan has its monthly submissions limit. See our pricing page for more details. We have been experiencing several issues with the "save" option. Students receive several error messages and are unable to submit their application when the use the save for later feature. Can you assist us? Is there a faster way to receive customer service as opposed to just submitting a question? My adoption link app has been down and I would prefer a one on one chat rather than messaging questions back and forth waiting for a response. I am new to JotForm and I am trying to develop my first form. When I click on "add form element," and then click on "header," I get "unexpected error occurred control_head." When I click on add form element and then click on "short text entry," I get unexpected error occurred control_textbox. Why am I getting these error messages? Why can I not just begin inputting the header or the text? I just downloaded JotForm Widget v1.1 for Adobe Muse. Following the instructions provided by Adobe, I imported the widget into my Library and then dragged it onto a new page. I received the "Form over quota" message but I have never created a form before therefore I can not have exceeded a quota. Why am I getting this error? The account is suspended. I do not know why it happened last night. I tried to log on. Password - Suspended. Last night I edited the third one of four reservation forms after I edited and shared two forms to my boss Don who is the owner of Deaf Globetrotters, website, and deafglobtravel@gmail.com. He checked and approved the forms. Later I was shocked when my account is suspended without warning. Help me... What do I do? Please activate the account. Let me know soon as you can. Thank you. Upload Error is appearing in my form when someone submits..how to resolve? Looked over the pages regarding the error I have and also 2 days requesting support and still getting the same error. Contacted Authorize.net and they checked and there end is working. Very frustrated with the time frame to find these problems fixed. Thanks for the help that I did receive, but not able to fix these errors. Oops! Form not found: 70794507130151. Already checked the form and no changes have been made to cause this to happen. Please help. I recently took over the Username: FTMotors account and also have a Username: MyCar account under the same email address is there away to combine the two forms onto one account? Today is April 1st and I'm still getting the Form over quota errors. what happened? We did an upgrade last week. And again today. Will the counter reset tomorrow or do we have to wait additional time? please be kind enough to explain why your robots banned by form? i checked your terms but really couldn't find any answer. Hi my form once previewed is missing background image, colour and some buttons?